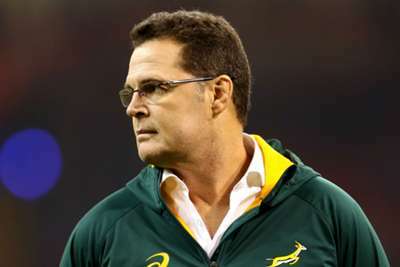 Rassie Erasmus says he will not remain as South Africa head coach beyond the 2019 World Cup. Erasmus, who is under contract as South African Rugby's director of rugby through to the World Cup in 2023, took over from Allister Coetzee in March. Though he has won only seven of his 14 fixtures, Erasmus has inspired something of a turnaround from the Springboks, who won a home Test series with England in June before beating New Zealand in Wellington as they finished second in the Rugby Championship. His role as head coach has led him to put his responsibilities as director of rugby to one side, but he expects to return to focusing fully on the latter role after next year's tournament in Japan. "I'm only head coach until the World Cup next year," he told SuperSport. "The six years [director of rugby contract] is not there to protect myself … it's there to protect SA Rugby. As we all know, if I don't perform then the people will vote me out. "When I was appointed director of rugby… at that stage I still thought Allister Coetzee was continuing. The leadership asked Allister to step down and then asked me to step in. "The moment I am finished with this [head coach role] and for the next six months, I will be involved with them [the other SA Rugby structures] a lot." Meanwhile, the Springboks have confirmed their Test schedule for 2019, with Johannesburg hosting their sole home fixture in a shortened Rugby Championship. South Africa will take on Argentina at home in a non-Rugby Championship clash in Pretoria on August 17.